Being able to admit when you are wrong is the hardest thing to do. Thinking you failed can really decrease your morale. The hardest part about being successful is being able to overcome your challenges at work. Are you confident in the things you create? Are you confident in your skills? Do you have problems communicating effectively with your team members or your boss? All these things can hinder someone’s ability to work productively. Overcoming these challenges isn’t impossible, but it is difficult. In this post, we are going to highlight some steps you can take to start the process of overcoming the challenges that you may face in your workplace. It’s okay to tell yourself “I am not good at this”. Admitting what is challenging for you is the first step. How can you help yourself if you don’t even know what the problem is? Sometimes your boss might approach you. Sometimes you’ll try to do something new and realize that you just don’t have the knack for it. And that’s okay. Recognize that something is challenging and reach out for help. You can approach your boss or even your coworkers for guidance. You’re given a task. You have extreme difficulty completing that task. Why? Do you have all the tools you need? Analyzing why something is challenging for you is the next step. You might not always know why something is hard for you. Maybe you don’t have the creative eye others do. You’re a logical person who can solve problems, not a designer who can create amazing postcards for marketing campaigns. It doesn’t hurt to try though, right? If you don’t know why something is challenging for you, then others can’t help you. Ask yourself, what is stopping me from completing this task to the best of my abilities? Once you know that something is challenging and why it’s challenging, you can figure out how to overcome it. It might take days. It might take weeks or months, but the key is to never stop growing. There is always something new to learn. You just have to give yourself time. There’s nothing wrong with learning a new skill. Don’t worry about being a master the first time around. Everyone started off as an apprentice. 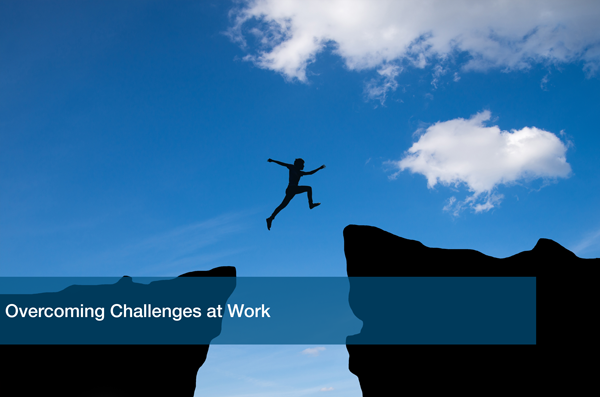 Overcoming challenges at work can be difficult, but it’s not a process you have to go through alone. Talk to your boss about ways that you can improve your skills to overcome those issues. Chances are they have gone through those troubles too and can offer you great advice. Here at ITC, when it comes to your tech we ensure that your team has everything they need to be successful. Schedule an IT analysis with one of your experts to find out how ITC can help your business and your team grow. We support your technology so you can focus on your business.